Chengdus & Don'ts: Gemma the hiking star! Gemma and I flew to Jiuzhaigou on Tuesday afternoon with our friends Andy and Penny plus their two visitors from England. Our friend Andrew, who works in the park, personally tailored our trip and what an incredible experience we had in one of China's best kept secrets. We took taxis from the airport to the park to meet up with Andrew. It was a little over an hour drive through gorgeous snow capped mountain. At one point in the taxi Gemma asked, "What is the white stuff on the ground?". I was a little surprised she didn't realize it was snow, but I guess that will serve me right having a desert baby! When we arrived at the park we quickly checked into the lodge and met Andrew out front. He took us to an area outside the park for a little hiking. 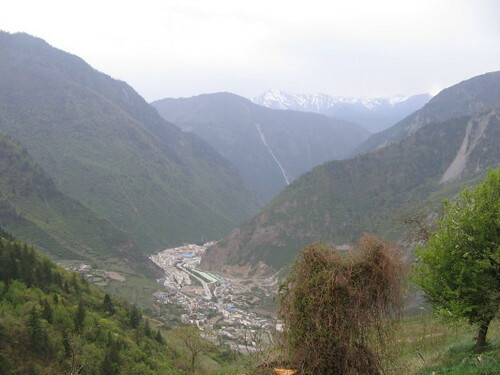 We hiked up a beautiful mountain for about a 1 1/2 to a deserted Tibetan village. The houses were locked up and Andrew suspected that the families hadn't returned from the winter yet. I was so impressed with Gemma's ability to climb up this mountain, which was about 10,000 feet high. She was a rock star climbing with little trouble. Here is a view of the valley from the top of the mountain. 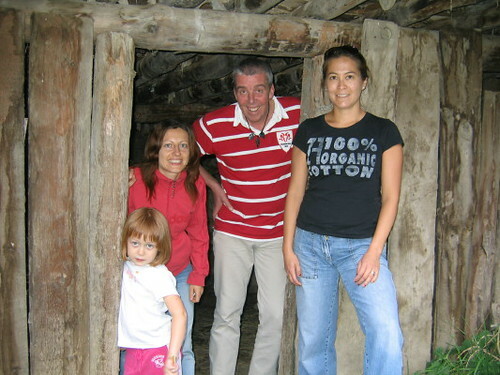 Gemma, Penny, Andy and I at the doorway of one of the houses. It was a great start to our little adventure! After our decent to the bottom, which took much less time. We headed to a Western bar and had drinks and a snack before having dinner. Andrew had ordered a goat for us for dinner from a lady who has her grill in the middle of the street. The goat lady (as he called her) barbequed a goat for us and it was absolutely fantastic! We also had a few barbequed veggies with our meal.